Most trees that grow near a building cause very little damage, but there are times when, subsidence and damage to foundations can be linked to the roots from a tree that is coming into conflict. The first you many be aware of it could be a drain that starts to leak or overflow, a paving slab that pops up or even the top of a root coming above the soil surface by the building. Stephen Bacon Tree Services have bean dealing with trees in the local area for many years and in that time have had to work with surveyors and specialists on projects such as this, so read on to find out more. Why do tress cause damage to buildings? Damage caused by subsidence only really happens on shrinkable clay soils. Older buildings are more at risk as they often have shallower foundations. Drain damage is caused when the roots break into the pipework and cause blockages. Further damage is then caused as the soil around the pipe is eroded away leaving cavities. Sometimes the branches can themselves fall and damage roofs and guttering, expanding roots can lift paving slabs and sometimes sheds and small garages. So what causes the damage? During prolonged drought, trees can dry out the shrinkable clay soil, causing movement in the footings. This sort of problem generally occurs late summer. 5-10mm of movement will generally see cracking occur around windows and door frames. In rare cases tree removal can cause “heave” whereby the soil pushes up as it remains wet and expanded. Tree roots generally move around footings s aren’t a direct problem. Tree roots will proliferate where the ground is more moist, hence why they like drains. How can damage be prevented or minimised? If you are planting then seek advice on the types of trees, soil and location. Many trees grow quite happily and never cause damage. Long periods of dry weather can see problems arise. Subsidence is the main problem faced. 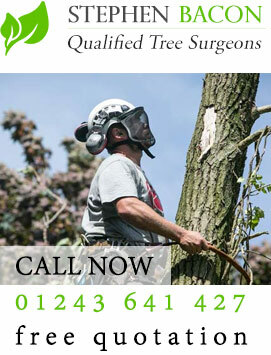 If you’re worried then get Stephen Bacon Tree Services to provide you with a professional survey. A tree is the property and responsibility of the land owner, who may be liable for any damage caused. Always check with the Local Planning Authority whether a Tree Preservation Order is in place before working on a tree. Stephen Bacon Tree Services provides a consultancy service so get in touch now.